Getting difficulties with converting video files? Use VLC media player to convert any video for all popular devices and video formats. Getting difficulties with converting video files using your older software. If Yes, than try using VLC media player for doing this task and see the result. This is the most popular video player software and and fully packed with features. You will be familiar with this media player and I am 100% sure you should have installed in your PC. If not install it now from their official site. Apart from playing videos, this software can also be used in converting videos. You can use VLC media player to convert video files to MP4, AVI, Android phones (Low Quality and High Quality), Ipad, Div X, OGG, Webm, video for YouTube and many other video formats. Don't know how to do this with VLC media player? 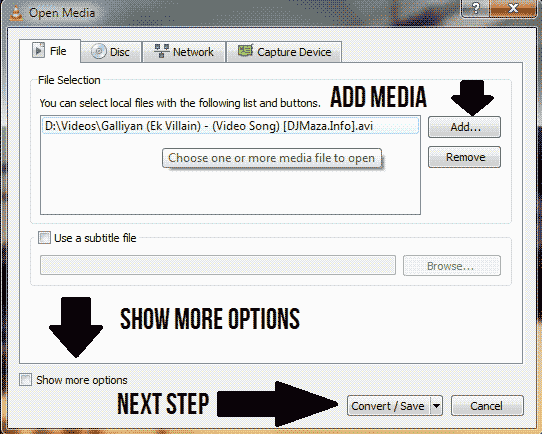 Follow these simple steps to get started converting videos with VLC media player. At first, we will Open VLC Media Player. 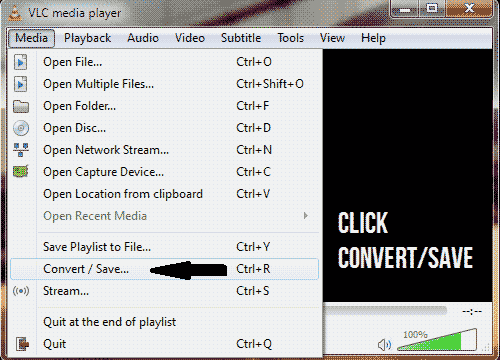 Now click on media and than click Convert/Save or simple or simply press CTRL + R after opening media player. See the image given below. After doing that, you will see the following Window. Click on Add to browse the video for converting it. Tick Show more options to see other customization options like start time and end time of video etc. Now, you'll see the following step. Choose your desired video file format and your destination folder (were video will be saved). Click Start. Done! Your video will be converted in few moments. Facing some difficulties understanding the above steps, see the video tutorial to know more about converting videos with VLC Media Player. 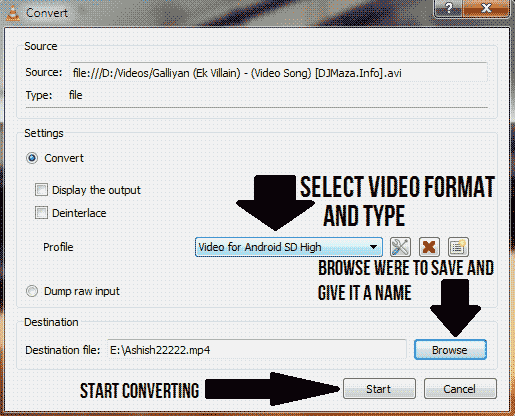 You can also convert videos from DVD/CD drive or use Video URL and converts its file format. I hope you'll enjoy using this software.